Thank you for your interest in volunteering at the 2019 Rendez-vous Annual Conference and Trade Show in Whitehorse YT August 12-16, please click here to sign up. Please note, this program is open to students in Canada and the United States only. CITT/ICTS Annual Conference and Trade Show Rendez-vous has been held for over 25 years. During that time, student volunteers have played a key role in guaranteeing its success. Whether they assist in mounting the trade show, setting up the social events, or helping out at the registration desk, the student volunteers contribute in making our annual event a tremendous hit! During the conference, student volunteers are assigned various task, which includes setting up and tearing down the Trade Show, troubleshooting technical problems such AV projectors, sound equipment, etc. helping out with hospitality, giving a hand at the registration desk, and more... ! As a student volunteer you are treated as one of the family. Volunteers are warmly welcomed and encouraged to take part in the activities and attend the events; it’s a combination of volunteer work and good times! Plus, we’ll introduce you to influential people in the industry such as professional workers, potential employers, mentors and teachers. The runner-up team at Junk Challenge Swag Bingo! As a student volunteer you can attend all the conference events including sessions, forum, social events, etc., but you are required to dedicate you time and volunteer in setting-up and tearing down the conference events first. The busiest day is Wednesday, which is the day we set up the trade show. Thursday, Friday and Saturday are also busy, but we make sure that the student volunteers are able to take in as much of the conference as possible. The work schedule is prepared by the conference technical director who manages the volunteer crews. Sign up and join us in Whitehorse, YT, next August for yet another exciting conference! 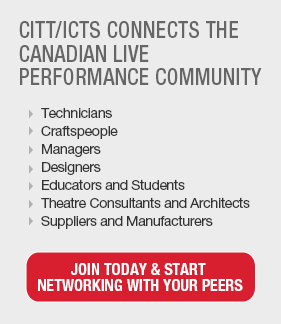 Be part of the action and connect with the Canadian live performance and entertainment community. Fill out the registration form and we will get in touch with you regarding your schedule and duties. * Benefits are subject to change without notice. Student volunteers must be legal drinking age of the province/territory in which the conference is held - for Yukon Territory the legal age is 19 years old. They are required to provide for their transportation to the conference as well as their lodging for the duration of the conference. For more details, please contact the CITT/ICTS National Office.